Dungeons and Dragons Treasures of Icewind Dale slot machine is the third slot in the series from IGT, based on the fantasy role playing game from the 1970s, and subsequently a TV series. The game has 5 reels, 30 paylines, a pretty tame maximum jackpot of 500x a line bet, and one bonus feature, which is a free spins bonus awarding up to 15 free spins. Read on for the full Dungeons and Dragons Treasures of Icewind Dale slot review below, as well as a Leo Vegas bonus to get you started. If you thought Dungeons and Dragons was solely reserved for spotty teenagers and 35-year-old men that live in their parents’ basement, think again – because IGT slots’ franchised Dungeons and Dragons Treasures of Icewind Dale slot is ready to bring the popular game to a brand new audience. Featuring five reels and 30 paylines, the game is set in the genuinely playable realm of Icewind Dale and includes a background of swirling snowstorms and suitably chilly sound effects. The unique symbols to feature on the reels include a range of intimidating-looking weapons and four character classes from the game itself, with the iconic 12-sided die appearing as the feature-triggering scatter. 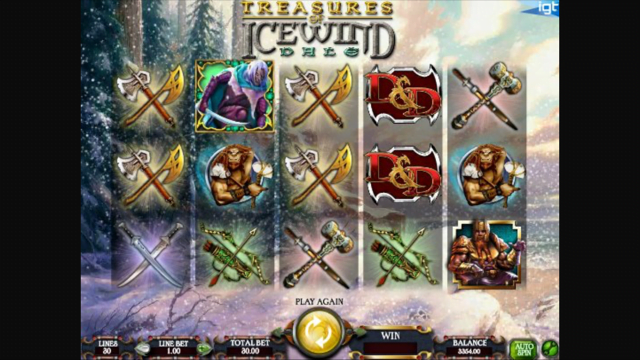 Playable from as little as £0.30 per spin with the maximum number of paylines active, the Dungeons and Dragons Treasures of Icewind Dale slot machine can be enjoyed across all desktop, mobile and tablet devices. Whatever their chosen level of investment, players will be able to chase a top base game award of 500x their line bet and there’s also a pretty innovative free spins feature to keep things interesting. As mentioned above, the key to triggering the Dungeons and Dragons Treasures of Icewind Dale slot main bonus is landing three or more golden dice symbols anywhere on the reels. Achieve this feat and you’ll instantly be awarded with 15 free spins that benefit further from an additional collectable wild twist. When the bonus games begin, you’ll notice that a new die symbol has been added to the reels along with an extra graphic displayed below the gameboard. The latter of these two additions displays all four character icons with empty spaces alongside them, while the former only features on reel five. As you play, you’ll notice that whenever the die symbol appears, one of the empty spaces next to a character is filled. Light up all three spaces and that symbol will become wild for the remainder of the feature, potentially enabling you to add up to four bonus wilds to the reels for huge prize payouts. Whatever your preconceptions of Dungeons and Dragons may be, IGT’s slot interpretation of the popular table-top game is an immensely enjoyable experience that can potentially award huge prizes, so we recommend giving the Dungeons and Dragons Treasures of Icewind Dale slot a try. Like the Dungeons and Dragons Treasures of Icewind Dale slot review? Check out these as well…..